Hello everyone, Gayatri here with you today. I have a watercolour card share for you. This card is very simple to make. Since watercolour is a massive trend at the moment, I decided to share a simple and easy way to watercolour. The watercolour background is something a beginner can do it. I trimmed down my watercolour cardstock and brush with some clean water towards the top left corner. I used Gansai Tambi watercolour. You can use any watercolour even your kid’s watercolour palette. I worked with one colour at a time. So I added the blue colour and let the colour spread and take its shape as there is water already on the paper. I dried with heat gun after some time. You can always air dry. Then I diluted the blue pigment with water and added over the blue wash to build layers. Dried with heat gun again. Then I added clean water to the edges of the blue wash and added yellow pigment. I repeated the process to build layers. I added some of the yellow to the blue to blend and get a green in between the two colour. I now let this watercolour panel to dry while I work to die cut. I have used In Bloom: Maggie’s Roses Cutaway to die cut few outline of the roses and leaves using white cardstock. I adhered the die cuts using glossy accent by applying only to the centre of the roses and bottom edges of the leaves. This gives a nice raised edges. I love that. The sentiment is from A Tree for All Seasons stamp set. I simply stamped the sentiment with Versafine Black pigment ink. This ink gets into those groves on the texture side of the watercolour cardstock giving a crisp and clean detailed sentiment. I have added Pretty Pink Posh’s Sparkly Clear sequins near the sentiment. Hope you are inspired by my card. Thanks for stopping by today! beautiful card Gayatri.. love the vibrant colors!! Wow !! what a gorgeous card Gayatri ..Love it !!! Stunning and so gorgeously done - love everything about this phenomenal card!!! Fabulous card, love the colors you chose!! This is STUNNING!!! 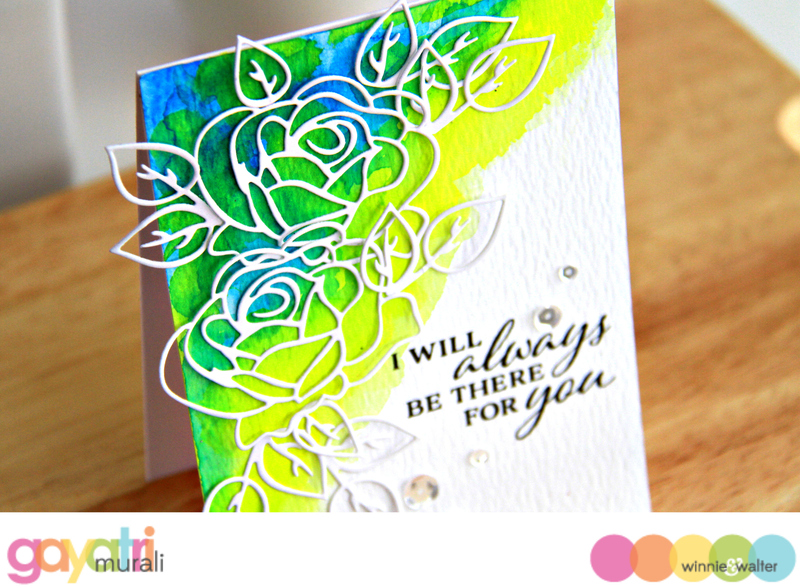 I LOVE the watercolor with that white die cut!! Your card is just beautiful. So lovely and lighthanded with the watercoloring...I like that. Brilliant! Love those bold colors ... layering... hmmm. This is so stunning! Love the bright colors. Wow, Gayatri! Your card is awesome...must CASE! Your card is beautiful! 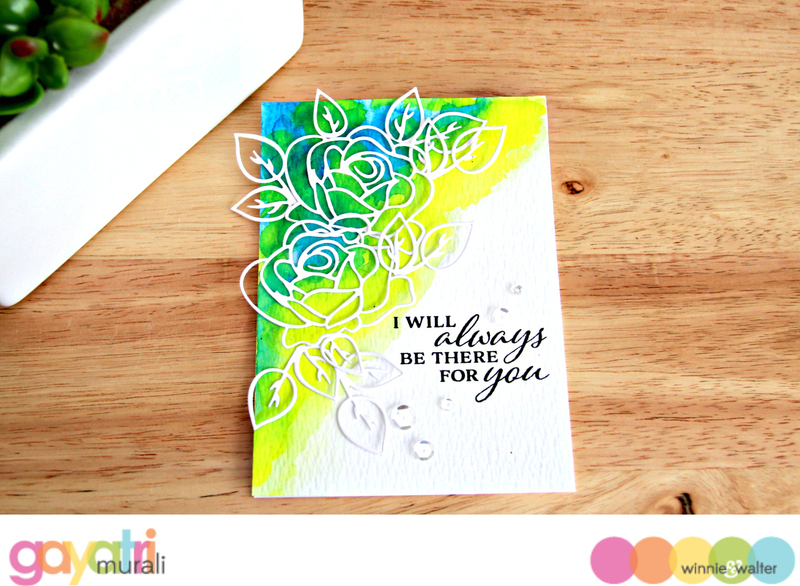 I love the bright colors peaking through the roses and the gorgeous sentiment. Thanks for the tip on the ink too. I'll have to give the Versafine a try on the watercolor paper. Stunning use of the diecuts...great colour on the base.